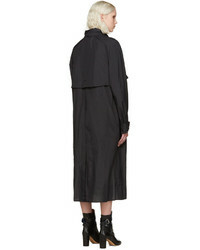 If you're searching for a casual yet chic outfit, pair an Isabel Marant black dracen trench coat with blue jeans. These two items are super comfortable and will look great when paired together. When it comes to footwear, this getup pairs wonderfully with black leather loafers. 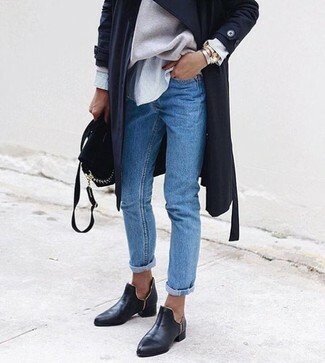 If you're on the lookout for a casual yet seriously stylish look, try teaming an Isabel Marant black dracen trench coat with black leather skinny jeans. As well as very comfortable, both of these items look great together. A pair of black leather ankle boots will integrate smoothly within a variety of combos. 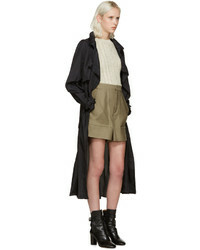 If you're hunting for a casual yet stylish getup, pair an Isabel Marant black dracen trench coat with blue ripped jeans. Both items are super comfy and will look great paired together. 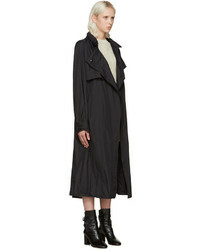 If you're hunting for a casual yet absolutely stylish outfit, make an Isabel Marant black dracen trench coat from SSENSE and blue jeans your outfit choice. As well as totally comfy, these two garments look wonderful when paired together. Black leather loafers are an easy choice here.